ÄR DU OCKSÅ EN SPACE HOLDER och känner kallet att bli hållen i detta, SAMT att djupna dina skills i att effortlessly, authentically, powerfully and consciously hålla space? I work on myself, so I can show up for my students and clients. I have so many clients coming to me with their deepest fears, vulnerabilities, insecurities and longings – so I need to know mine. I show up for this. I release my wounds and lower frequencies, allow for them to transform into higher densities. I reprogram my DNA. I’ve worked on myself every day for the past 28 years, so that I can show up and hold space for people, so they can learn to hold embodied space for themselves – whether in yoga, Soul Coaching, therapy, or conscious dance. I’ve spend since 1989 trying to understand more and more how to hold space for myself and for others. My achilles heal has always been finding it hard to find people holding space for ME when I hold space for myself. Intimate community support, simply. Very often and for many years I’ve done it alone. It was a lonely business. So. Learning (the hard way) that I need to EQUALLY TO WHAT I GIVE TO OTHERS re-charge myself as a space holder (and NOT ONLY through the bliss of holding space, teaching and coaching) has lead me to create more and more women’s circles, temple groups etc. And those circles has now lead me to call in more space holders closer. 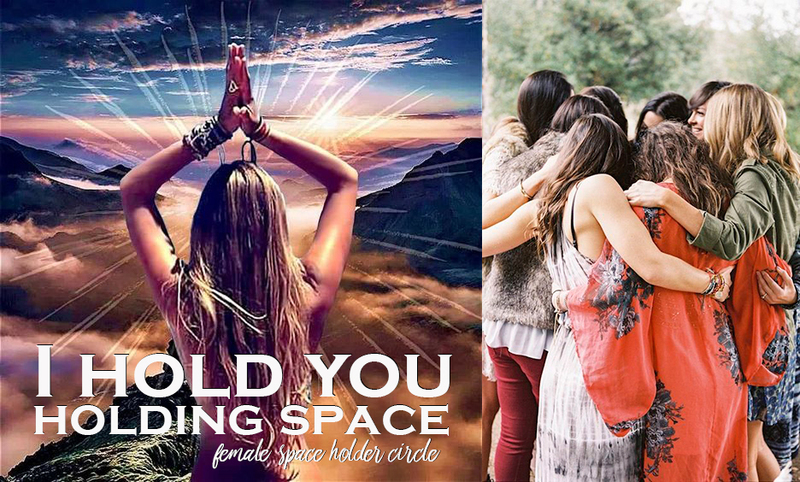 I am inviting at this time all female Stockholm space holders – yoga teachers, conscious dance facilitators, therapists, coaches, etc in works since 2 years or more – into a circle called I HOLD YOU HOLDING SPACE®  this fall. Teachers, therapists, and facilitators of conscious or embodiment practices (yoga, dance, women’s circles etc etc). Note: You have at least 2 years of solid experience in teaching regularly. This is to hold the integrity of this first circle, and to build a solid foundation for more I HOLD YOU HOLDING SPACE® circles to come after this one. Please state in your request to join, your space holding experiences. We gather 5 Tuesdays this autumn at YogaShakti. I will hold space for the space, and some Tuesdays might be co-hosted by others with me (feel free to volonteer!!). We will have a closed Facebook group I HOLD YOU HOLDING SPACE® to share and keep the circle active and warm, between our IRL gatherings as well as after. This group will only be open for this first group, and in the future it will be joined with space holders who have completed the 5 meetings circle. So the I HOLD YOU HOLDING SPACE® community will continue to generously grow and expand, founded on the same basis. ÄR DU INTE I STOCKHOLM? ✨ Be excited anyway! I HOLD YOU HOLDING SPACE® kommer som online program senare också, samt OBS: jag reser gärna till Din community med en weekend workshop på request. Email me! . Send an email to mia@littlewing.se. Please state in your request to join, your space holding experiences of the past 2 years. Please share and invite and open your arms for all the sisters that you can think of to welcome into this gathering! ✨ Let me know if you want to contribute in any way, sharing your greatest gifts!